UP: A distribution center is for distributing, not for inventory. From a true lean perspective, a distribution center is non-value added (NVA) in the eyes of the end customer. However, inventory may have business value. It may benefit internal customers, for example. JJ: Inventory in distribution may provide a competitive advantage in customer service or cover a customer service problem. The former may be important to the business plan while the latter might be waste. UP: Ultimately, we are shooting for real JIT: A reliable replenishment of goods from the supplier, and a suitable inventory buffer to protect us from demand variability. Our goal is perfection, pure synchronicity. MG: Key factors for Distribution Operations include capacity utilization and time utilization -- getting as much on the truck (or railcar, boat, or plane) as possible and keeping the equipment moving productively while minimizing down time. MG: this requires excellent forecasting, scheduling, and inventory management -- anticipating demand, scheduling tightly to it, and ensuring there is just enough inventory to meet it. In turn, this requires having people, equipment, and your vendor network ready to go when needed. JJ: The total inventory level within the total supply chain needs to be looked at. This includes the inventory levels coming off of the supplier inputs (whether from internal make operations or from suppliers) as well as the inventory levels within the distribution operation and downstream at the customer locations as well. MD: There are typically many suppliers with different policies. The distributor may be stocking items manufactured in other countries with more of a batch mentality. One may be forced away from single piece flow because of lead times, minimum order sizes and so on. The manufacturers don't want to transport air in partially empty cargo ships or trucks. MD: Solving the quantity shipping issue might mean something radical like building a new factory closer to the distribution warehouse, which would enable a pull system, milk runs, move distribution closer to single piece flow. That may be prohibitively expensive, however, so there may not be an easy solution. Companies have different ideas about how to manage the distribution channel. PN: Wal-Mart has suppliers helping manage the inventory and order replenishment re-counts in a push. While as a supplier, Coke pushes order replenishment with retailers. GM: The best thing to do is go back to the roots of lean. Keep it simple! AC: One of the greatest challenges is always what to do first and how to limit the field of ideas for Lean implementation. Lean is a continuous improvement mechanism and the goal is perfection—it’s not exactly an overnight process. It requires patience and commitment. MG: Applying Lean principles means mapping out distribution processes, eliminating unnecessary steps and other forms of waste, and executing crisply every time to the standard. Sounds simple, tough to execute, but fun when it works well. JJ: The logical first step in any lean application is to value-stream map the major processes in order to determine the full scope from supplier inputs to customer outputs (SIPOC, in 6 sigma speak). MD: Identify the seven or eight (depending if one is a purist or a modernist) forms of waste, then reduce them. Make sure that the voice of the customer is used, whether through Kano Modeling or some other tool, use a pull system--only purchase at the rate that the customers buy--hard to forecast, sure, have to build some inventory, sure, but work with manufacturers to lean out their processes as well. Do it right every time. Old concept but works every time. UP: All these concepts, lean, six sigma, JIT, buffer management, cross-docking, will help get us there (to pure synchronicity) and, in some places, with use of technology i.e. RFID, telematics. It's happening, as lean as it can be, as it flows in and flows out right before our eyes. AC: I’m sure you have read "Lean Thinking" by James Womack. It’s a kind of bible and I re-read it about once a year. PN: Another area that would be interesting to note would be a large cargo shipping carrier. I'd like to get some insights into how trans-oceanic cargo gets distributed with the trade offs between the “must have it by X date” and rates variables. You can do the same with train cargo, but the sea carriers would exaggerate the issue. Dr. Kathleen Yaremchuk, head of clinical practice at the Henry Ford Health System in Detroit, saved enough time for doctors to avoid hiring eight more of them, practically with the stroke of a pen, reported Jay Greene in Monday’s issue of Crain’s Detroit Business. The magazine honored her as one of its annual Health Care Heroes. She stopped sales reps from pharmaceutical and medical device companies from bringing pizza, pens, and samples to butter up the doctors in the system’s seven hospitals and 27 medical centers. She called it an influence-free policy, and it was instituted in January 2007. My friends who have been helping hospitals like the Henry Ford System’s to bring lean to healthcare already know that sales reps clutter up the place, even dressing in surgical scrubs to hang out in the operating room touting the latest in jazzy gadgets. They know that hospital staff may gravitate to the pizza to the detriment of patient care. They’re aware that the more influential doctors get lunches and dinners in nice restaurants. Dr. Yaremchuk couldn’t have made this change by herself. It took more people to do some root cause analysis for the issues that made reps so welcome. It had to involve others to create processes for pharmaceutical and device reps to make doctors aware of new products in a more orderly way. As an example of root cause discovery (asking why), one reason for the popularity of reps bringing in food was that residents had too little time between lectures and hospital duties to get lunch. So the cafeteria added an express lane for doctors to speed them through the lunch line. To standardize the sales visit process, sales reps must now meet a number of requirements before they can enter the hospital and talk to doctors. They go through a vendor certification course to make certain that they understood health safety procedures and privacy and confidentiality policies. The Crain’s article said 2,000 vendors have since been certified. (2,000! The hospitals might as well have been conference exhibition centers!) Sales reps permitted to enter the operating rooms have to wear black scrubs, not the green ones worn by the doctors. Sales reps must request appointments with doctors, at least five days ahead of time, via a web-based system. And doctors turn out not to be overly fond of these visits. Only 29% have been accepting the requests, and some have added themselves to a “do not call” list. If the sales reps get in, they have just 15 minutes to make their pitches. The policy was not a fiat from a top-floor management meeting. Dr. Yaremchuk has plenty of knowledge of what goes on at the gemba, the place where services are delivered. 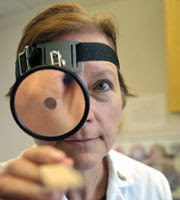 In addition to her management responsibilities, she’s chair of the hospital’s clinical otolaryngology department. Results? The article said the appointment process has freed up time equal to employing eight more doctors. Before the changes, that work of the eight doctors was probably coming from long hours for the doctors who were on staff. “We gave them time,” Yaremchuk told Greene. She said doctors can go home on time, provide more patient care, or do paperwork (which could probably be cut down significantly with some continuous improvement events). An estimated $10 million has been saved as doctors now prescribe generic drugs 74% of the time, up from 60% in the past. Without sales reps prodding them, they use more tried-and-true medications unless the new ones have been shown to be really more effective. Not all drug companies were disappointed with the new policy. Those from smaller companies that couldn’t cater lunches or come bearing gifts felt the playing field had been leveled. It’s a change that took a high-level leader to make. Those in the system were used to the process and didn’t have the interest or power to do it. However, a cadre of lean-thinking hospital staff could make a proposal to a leader who had some commitment to improvement. Dr. Yaremchuk regularly shares her story with hospital CEOs who are interested. Even if your CEO won’t go to one of her lectures or visit Detroit to meet her, would he or she be willing to video-conference her into a management meeting? It might be an hour that sparks a big change.